The services of AZ Car Keys are less expensive to use if you lose your Chrysler car keys. Having a car key replaced in Phoenix is a really easy thing to do. We are a better option than car dealers for Chrysler car keys in Phoenix. At some point in your life, you will end up losing your car key but this should never happen to your last key. And if you have been in a car dealership there before you know how expensive the offered services are. There are people who postpone purchasing an additional key mainly because they fear the costs related to the services. They therefore choose to care for a single key. If you need an additional key for your Chrysler Car or one of its models, you will find this information helpful. Each programmed key features a “digital signature” which is important in uniquely identifying the right key for a car. Two programmed keys will have 2 unique digital signatures. This is the form of car key which you can get from a car dealership. Vehicle dealers make them by copying the exact same digital signature from a programmed key onto another key. As a result, the vehicle can’t tell the difference between the keys. In other words, it will see the same digital signature on both car keys. Most of Chrysler car keys with this ability allow simple programming procedure, which you can do by yourself. But after the simple programming, your vehicle should see two programmed keys. This is more like a safety deposit box and therefore to program more keys, your vehicle has to see 2 different digital signatures. This is an anti-theft feature present in Chrysler car and its models and has nothing to do with keys themselves. Most hardware and depot stores do not have the special equipment needed to program keys and they therefore clone keys. This is a form of key which ignites the car after you have inserted it into the ignition and turning it. You can prevent other unwanted individuals from starting up your vehicle with the metal key. to do this you have to disable the turning ability of your vehicles ignition. BCM. Anytime the vehicle’s computer senses this chip, the key will turn the ignition without the vehicle starting. Typically, a fob key is a combination of a remote control and a transponder key without metal blade. This type of key locks more like a remote control. It has some buttons which the driver uses to lock or to unlock the doors of the Chrysler car. 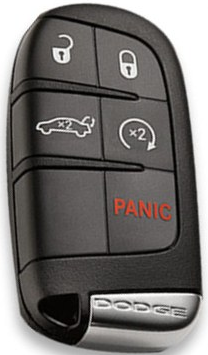 Vehicles with fob keys do not have any place where you can insert the standard metal key but instead it features a place where you can insert the remote control to start the vehicle. After inserting the remote control, the car’s computer recognizes the computer chip mounted in the fob and deactivates immobilizer. These keys feature proximity transmitters which are incorporated into the vehicles remote control. The vehicle’s computer effectively recognizes the transmitter and therefore a driver can open the vehicle’s doors by simply touching them or even touching a button. The keys also allow the driver to start the vehicle by pushing a button including when they have the keys in their pocket or bag. This is another type of Chrysler car keys. It is an older type that was produced for limited models in the past. This form of vehicle key features a chip situated at the middle of the key and works whenever it gets into contact with the car’s ignition. Whether you have a standard metal key, fobs, transponder key, proximity keys or the vehicle Anti-Theft Systems (VATS), you should take the security of your vehicle very seriously. Always keep your vehicle keys safely because they are the only weak points in relation to your vehicle’s security. A thief will hardly steal your vehicle if they don’t have its exact key. In addition, considering the many features in some keys, replacing one can be quite expensive. Therefore, ensure that your car’s key is always closer. Call AZ Car Keys For Replacement Chrysler Keys Today!! It's been days and I couldn't find my car keys anywhere! I called these guys and they were able to program me a replacement key for my Sebring that day! Highly recommend!